Exchange-traded funds (ETFs) currently make up nearly one-third of all U.S. trading by dollar value and nearly a quarter of all share volume. That’s pretty amazing for a product that has only been around since the 1980s and didn’t really “show up” until the middle-to-end of the last decade. ETFs are mutual funds that can be bought and sold during the trading day at the current market price, while mutual fund shares are redeemed at the end of the day based on the net asset value (the worth of the fund’s portfolio at closing prices). ETFs must disclose holdings daily while active mutual funds do it quarterly or semi-annually. Unlike mutual funds, ETFs are less likely to have taxable events, making them more tax efficient. ETFs come with stock transaction costs whereas mutual funds may or may not have any transaction costs. ETFs are generally based on indexes rather than active management or complex strategies. Typically, you’ll see ETFs cover sectors like healthcare and technology or commodities like gold and crude oil, or simply track an overall index (like the popular NYSEARCA: SPY on the S&P 500). However, there are some exotic ETFs that use leverage or track the inverse of an index. Fund vs. debt note: ETFs are actually funds that own the underlying assets. ETNs are debt notes issued by an institution, essentially unsecured bond guarantees to the index or asset they’re trying to track. Tracking error: Over time, an ETF will not match the underlying index or asset it’s tracking due to a combination of management fees and transactional fees. Example: oil ETFs lose value over time due to the cost of rolling futures contracts plus management fees. ETNs have no tracking errors other than their management fee and tax fees. Because of these two major differences, the tradeoff between the two is risk. ETNs accept the risk of the underlying product plus that of the issuing institution. ETFs only accept the underlying product risk, but you also get tracking error. The risk is high with ETNs, though. To date, there are no known ETFs that have closed and weren’t able to be redeemed at their net asset value. However, there are examples of leveraged crude oil products to a recent ETN issued by Credit Suisse (XIV) that crashed 80% in one day. ETFs provide some of the best ways for retail investors to gain exposure to various sectors of the market without opening numerous accounts and oftentimes are available in self-directed retirement accounts. They’re open to investors. Mutual funds can sometimes close to new investors if they have limits on the amount of clients. ETFs are only limited by the number of shares available and someone willing to sell them. Brokers offer commission-free ETFs. Many brokers offer commission-free ETFs that you can purchase through everything from regular trading accounts to self-directed retirement accounts. Though each broker may have a version of the same ETF, as long as they have decent liquidity they’re all roughly the same. They’re diversified. ETFs provide an easy way for investors to expand their product holdings and manage their own portfolios rather than relegate the authority to fund managers. Taxes are easier. Without getting into the gory details, the ability to trade ETFs like a stock makes it easier to do taxes and forecast them, while nuances with mutual funds can cause unexpected tax events. They carry relatively low fees. Since most ETFs track an index, commodity or simple strategy, they generally have low fees since they require little management. ETFs that invest in other countries may be limited to larger companies or a particular set of companies based on the index they track or governmental rules. As larger ETFs have great liquidity, some of the newer, niche or smaller ETFs do not have high liquidity. In fact, some trade as few as a few hundred shares a day. While an ETF that provides 2x exposure to the S&P 500 may seem straightforward, it may not be. Some of these ETFs track the daily price movements in the index, meaning they quickly decouple from the underlying index. Check out the chart below to see how the math could work out. Fees and management: It’s worth understanding management fees, expected fees associated with buying and selling the ETF as well as the fees an ETF incurs to track its index. 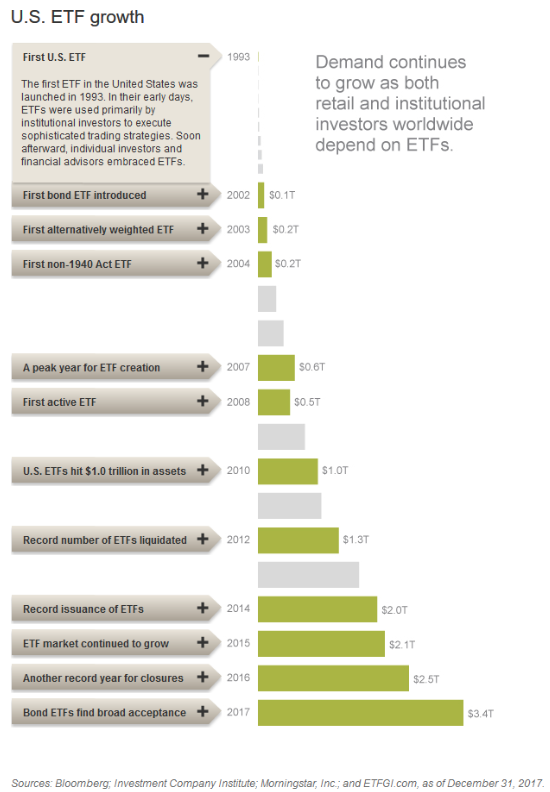 Pick a broker: Most major brokers in the U.S. provide access to any ETF that is openly traded. Many brokers offer their own ETFs or partner with a company to provide ETFs that don’t have any trading commissions associated with them but may require a certain holding period. Decide how much to invest: Once you understand what an ETF tracks as well as what it holds, you can decide how much you want to invest in an ETF. Keep in mind that if you already own Apple shares and you purchase an ETF that tracks the S&P 500, you’ll get additional exposure to Apple through that ETF. Purchase the ETF: You can buy the ETF you’ve chosen during normal trading hours as you would any stock. Check out the Benzinga’s picks for the Best Brokerages for ETF Investing. In the last decade and a half, ETFs have grown to global record levels in excess of $4.6 trillion. U.S. ETFs alone topped $3.3 trillion in 2017. The Bank of Montreal noted in its annual report that it expects the industry to continue to grow both in total assets as well as options available. The industry is projected to double to more than $10 trillion in the next five years. You need to do your homework to understand how ETFs actually function. Many ETFs track the S&P 500, but not all are created equal. If you compared the SPDR S&P 500 (SPY) to Vanguard S&P 500 (VOO) you’d notice that the expense ratio fees for SPY are 0.09% vs 0.04%. However, digging a bit deeper, you’ll see that SPY distributes dividends while VOO reinvests its interim cash. Nuances like these are what you’ll need to hsh out.